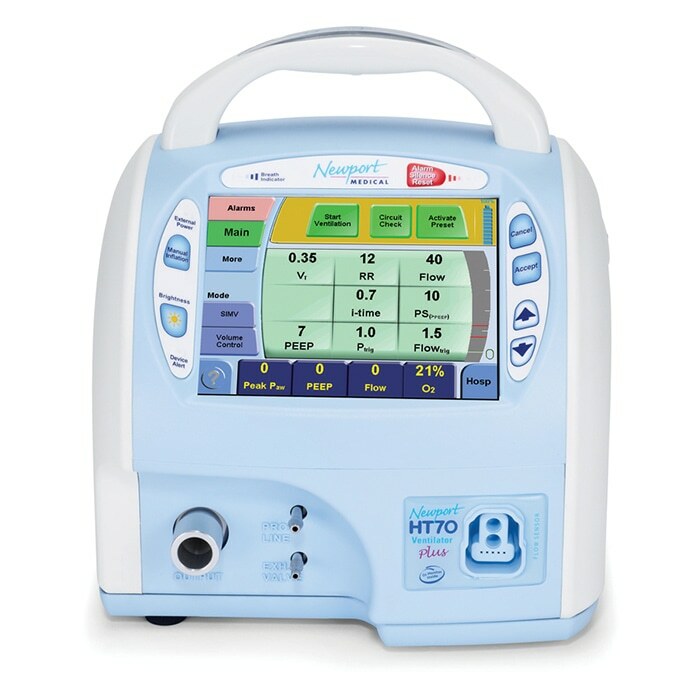 The Newport™ HT70 Plus ventilator combines ruggedness, ease of use and clinical proficiency with exceptional mobility for patients from 5kg to adult. All models of the Newport HT70 ventilator family can be used for home care, transport, hospital, long-term care and emergency preparedness, as well as for invasive or noninvasive ventilation. In addition to its standard clinical features, the Newport HT70 Plus ventilator offers an on-airway flow sensor that provides expanded monitoring with alarms and the choice of flow or pressure trigger. With waveform graphics, an oxygen cylinder usage calculator and internal battery use time estimator, the Newport HT70 Plus ventilator goes beyond standard portable ventilation.